Today is Friday 13th, so it feels very apt that it is also the fourth anniversary of Marty arriving in my life. 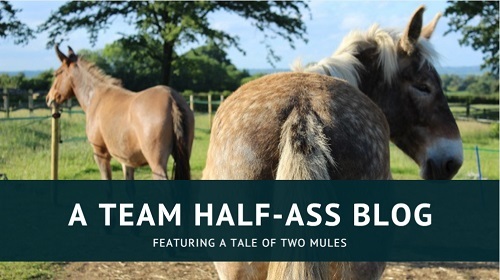 I don’t think I’ve ever actually made a blog post about how we ended up with a mule in the first place, other than what I wrote in his Mule Tale. I’d never been involved with mules before and I don’t think I’d even seen one in real life, but within two weeks of Marty’s previous owner asking if anyone would like him, he was ours. The first year wasn’t too bad; we had a lot of highs and lows, but overall we maintained our optimism. 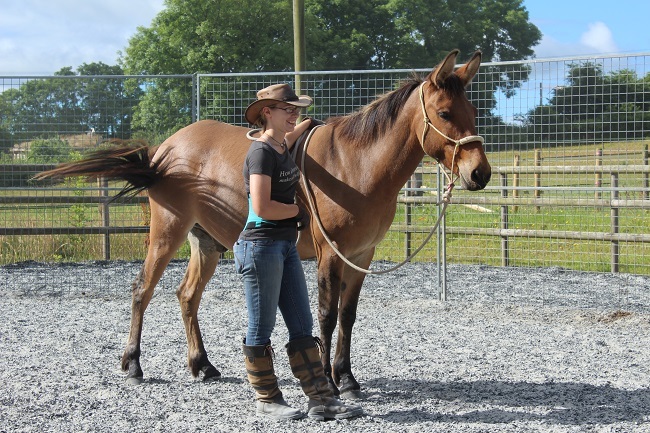 Then things began to unravel and got steadily worse until eventually we sent him back to Devon and into training with Anna Bonnage in 2016. 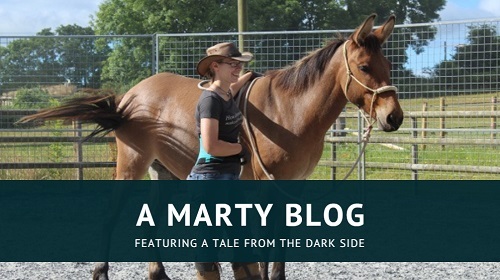 Shortly before he went, I was offered Xato – who I initially turned down, because I didn’t know what was going to happen with Marty. Then towards the end of his training I decided I couldn’t go on with him despite the changes he (and I) had made, and even went as far as ringing the Donkey Sanctuary to see if they’d take him … but I couldn’t go through with it. So after a short and ultimately unsuccessful stay elsewhere in the village, Marty came home for good. I may not be riding him yet, but since that month with Anna he has been on a steady upward curve of improvement. He’s a pleasure to be with and even on the bad days it’s now pretty easy to turn things around. By this point, based on how his behaviour is always much worse between January-March and that wet weather adversely effects him year round, I am fairly convinced that he has some kind of seasonal allergy or sensitivity to barometric pressure. His twitchy behaviour is often preceded or accompanied by slightly swollen third eyelids, though this symptom does not always occur; when I was finally able to get it looked at by a vet (it had never been present during previous vet checks), she was unconcerned and suggested only that it might be a very mild case of conjunctivitis. I have since heard that a visible third eyelid like this is often connected with head trauma or brain injury, which is interesting and something I need to do more research on; after talking to a friend with a TBI, a lot of medical and observational things about Marty have certainly fallen into place. This little mule has brought a lot of good things my way. I have learnt so much because of him! Great picture of the two of you! Perfect.